This is perhaps the most fun 4-5 player game I've ever played. It's full of swash-buckling encounters, has simple yet interesting rules, enough strategy to keep your brain working, but not too much to bore those who don't go for that, slices of fortune and a lot of laughs. The idea is to be the most famous pirate on the seas. To that end, you collect fame points through a variety of actions. 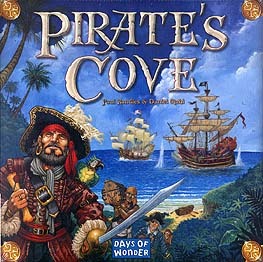 You have to sail to islands hoping that you won't meet the legendary pirates before you are strong enough to beat them. Thus, at the start of each turn, each player sets his compass to go to one of 6 islands (a seventh one is a safe-haven for repairs to battle damaged ships). Sometimes, you want to take on your fellow players and sometimes you want to avoid them, but second guessing where they'll be is not easy! Battles can be influenced by a variety of cards and if you flee before combat you run the risk of a mutiny. The board, cards and pieces are beautiful. There are a ton of variations that can be used from the PiratesCoveGame.com site...I've sent some of my own legendary pirates in. The Drunken Pirate and Blackbeard variations are recommended. Shiver me timbers - you gotta buy it!